Relative permeability and capillary pressure defined capillary pressure as the difference in pressure across the interface between two phases. 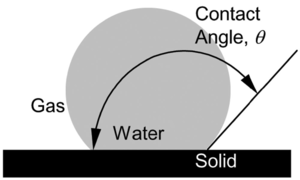 Similarly, it has been defined as the pressure differential between two immiscible fluid phases occupying the same pores caused by interfacial tension between the two phases that must be overcome to initiate flow. This page discusses capillary pressure forces. An approximation of the recovery efficiency during primary or secondary recovery. Evaluating capillary pressure of potential reservoir and seal rocks is important because capillarity controls the static distribution of fluids in the reservoir prior to production and remaining hydrocarbons after primary production. ​The relationship between capillary pressure and fluid saturation could be computed in principle, but this is rarely attempted except for very idealized models of porous media. Methods for measuring the relationship are discussed in Measurement of capillary pressure and relative permeability. the wettability of the porous material is an important factor in the shape of capillary pressure relationships. Wettabilities of reservoir systems are categorized by a variety of names. Some systems are strongly water-wet, while others are oil-wet or neutrally wet. Spotty (or "dalmation") wettability and mixed wettability describe systems with nonuniform wetting properties, in which portions of the solid surface are wet by one phase, and other portions are wet by the other phase. 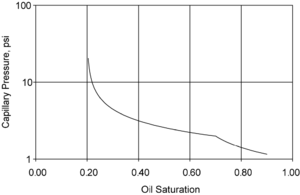 Mixed wettability, as proposed by Salathiel describes a nonuniform wetting condition that developed through a process of contact of oil with the solid surface. Salathiel hypothesized that the initial trapping of oil in a reservoir is a primary drainage process, as water (the wetting phase) is displaced by nonwetting oil. Then, those portions of the pore structure that experience intimate contact with the oil phase become coated with hydrocarbon compounds and change to oil-wet. 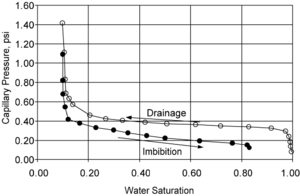 The drainage and imbibition terminology for saturation changes breaks down when applied to reservoirs with nonuniform wettability. 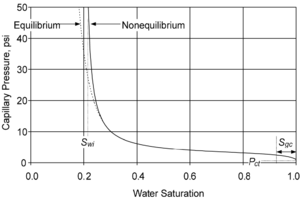 Rather than using drainage and imbibition to refer to the decreasing and increasing saturation of the wetting phase, some engineers define these terms to mean decreasing and increasing water saturation, even if water is not the wetting phase for all surfaces. When strongly water-wet, Sor is approximately 14%. When intermediate-wet, Sor rises to approximately 35%. When strongly oil-wet, Sor returns to approximately 15%.